Publisher: MacMillan & Co., 1879. Reprint Edition, BeerBooks.com, 2005. Hard Cover, 420 pages, 6.25 x 9.25. In 1876, Louis Pasteur published his ground-breaking volume, Études sur la Bière, soon translated into English as Studies On Fermentation. The book changed the course of brewing during the late 19th and early 20th centuries, representing a huge leap forward in the scientific understanding of the processes involved in beermaking. Brewers around the globe put Pasteur's findings to work in their breweries, and thus plunged the industry headlong into the modern era. 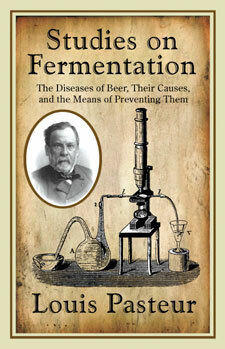 In tribute to Pasteur's tremendous contributions to brewing science, BeerBooks.com has reprinted Studies On Fermentation exactly as it appeared when first released in English, complete with all of Pasteur's illustrations. An original 1879 edition was digitally scanned, professionally enhanced and reproduced in a hard cover format. In his preface, Pasteur modestly wrote, "I need not hazard any prediction concerning the advantages likely to accrue to the brewing industry from the adoption of such a process of brewing as my study of the subject has enabled me to devise, and from an application of the novel facts upon which this process is founded. Time is the best appraiser of scientific work, and I am not unaware that an industrial discovery rarely produces all its fruits in the hands of its first inventor." But, of course, the brewing industry recognized almost immediately the impact that Pasteur's work would have on the art and science of beermaking. Frank Faulkner, the British brewing scholar who performed the English translation, wrote, "Seeing the vast importance of Pasteur's work from a practical point of view, after writing a review of it for the Brewers' Journal, I determined to procure, at any rate for the use of my own pupils, a literal translation, illustrated by photo-lithographic copies of the original plates...It was on the completion of this translation that my views and desires expanded. The more I studied the work, the more I was convinced of its immense value to the brewer as affording him an intelligent knowledge of the processes and materials with which he deals...I determined accordingly to publish the work if I could secure the consent of its distinguished author...The debt which we English brewers owe to M[r]. Pasteur can hardly be over-estimated."